A city run company in British Colombia, Canada provides condos with geothermal power. Alexandria District Energy Utility (ADEU) is a geothermal energy project that is owned and operated by the City of Richmond and, by 2018, this renewable energy system, which primarily cools and heats condominiums in the West Cambie neighborhood, is set to triple in size. The $12.3 million expansion of the project has received approval by Richmond City Council. By 2018, the system will service 10 developments in total. The largest development will be the section of the SmartCenters commercial retail site where a Walmart has been planned for development. Currently, ADEU services Mayfair Place and Remy, two developments with more than 600 units, and they are expected to service a third, Omega, this summer. To date, the company has already spent $6 million. Following the expansion, which will be the third phase of the project, ADEU is anticipated to heat and cool 2.3 million square feet of commercial and residential space. This works out to be around 65% of the total service area, a number that is likely to fluctuate as buildings become operational over time. The ADEU provides condos with geothermal energy at market rates or below. To be able to meet its expansion goals, a new geo-exchange field, a cooling tower, and a supplementary building to accommodate the equipment will be built in the West Cambie Neighbourhood Park; a project that will commence next year. The way the system works is ADEU takes water from the buildings in the surrounding area and pumps this water through pipes that have been installed underground, which results in the cooling of buildings in the summer and heating in the winter. During the next five years, the money needed for the project will be borrowed by the city from its water utility surplus. The entire $23.3 million investment should be fully paid back with interest within 19 years. To service the loans, the city charges land owners for the power at market rates or below. 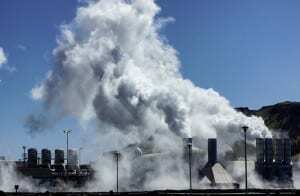 The geothermal energy project is expected to save 9,500 tons of greenhouse gasses (GHG) over the course of 12 years, according to a staff report. After this point, ADEU is anticipated to lower GHG by 671 tons annually.